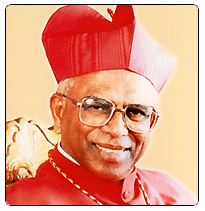 Directory >> Bishops >> Ernakulam - Angamaly Archeparchy >> Mar Varkey Cardinal Vithayathil C Ss.R. Mar Varkey Cardinal Vithayathil C Ss.R. Born on 29th May 1927 of Thresiamma and Justice Joseph Vithayathil ant North Parur, Archbishop Varkey Vithayathil had his school education at North Parur and Thiruvanathapuram, and his college education at University College Thiruvanathapuram, and St. Joseph College, Trichy. Joining Redemptorist Order, Varkey Vithayathil professed as its member on 2nd August 1947, and after completing his studies in Philosophy and Theology he was ordained Priest on 12 the June 1954. In 1955 he went to Rome for his studies in common law at the university of St. Thomas Aquinas (Angelicum) from where he took doctorate in 1959 on “The Origin and Progress of the Syro-Malabar Hierarchy”. After coming back from Rome, Dr. Varkey Vithayathil served as professor of Canon Law for about 25 years at the Redemptorist Major Seminary, Bangalore. In 1972 he took his Master’s Degree in Philosophy from Karnataka University. He also taught different subjects in several other Seminaries in Bangalore. He served as the Provincial Superior of the Redemptorist Order from 1978 to ’84, and as president of the CRI from 1984 to ’85. He was appointed Apostolic Administrator of the Benedictine Monastery in Bangalore (1990-96) by His Holiness Pope John Paul II. On 18th December 1996 Rev. Dr. Varkey Vithayathil was nominated Titular Bishop of “Antinoe” and the Apostolic Administrator of the Syro-Malabar Major Archiepiscopal Church and of the Archdiocese of Ernakulam-Angamaly. He was consecrated bishop in Rome by His Holiness Pope John Paul II on 6th January 1997. He assumed charge of the Syro-Malabar Major Archiepiscopal Church and of the Archdiocese of Ernakulam-Angamaly on 18th January 1997. On 23rd December 1999 His Holiness Pope John Paul II appointed Mar Varkey Vithayathil as the Major Archbishop of the Syro-Malabar Church and as the Archbishop of Ernakulam-Angamaly. His enthronement as the Major Archbishop took place at St. Mary’s Basilica, Ernakulam on 26th January 2000. His Holiness Pope John Paul II nominated Mar Varkey Vithayathil a member of the College of Cardinals on 21st January 2001. In the consistory on 21st February he was raised to the dignity of a Cardinal. The sacerdotal golden jubilee of the Major Archbishop Mar Varkey Vithayathil was celebrated under the auspices of the Syro-Malabar Church on 8th November 2003. The jubilee was inaugurated on 12th June 2003 and was concluded on 12th June 2004 He is a member of the Congregation for the Oriental Churches, of the Pontifical Council for Legislative Texts and of the Pontifical Council for the promotion of unity of Christians. He participated in the funeral rites for Pope John Paul II and in the conclave which elected Pope Benedict XVI.